Damascus: Syrian television interrupted its regular broadcast on Saturday morning with patriotic songs from the 1960s, showering the armed forces with praise, shortly after announcing that Syrian anti-aircraft defences had downed an Israeli fighter jet in the early hours of Saturday. Residents of Damascus were awakened by back-to-back sounds of large explosions at approximately 5.30am, thinking that they were part of the routine fighting of the Syrian War. On the other side, in the northern Israeli city of Beit She’an, the sound of sirens pierced through the skies, activated as a result of the Syrian anti-aircraft fire. Tel Aviv’s Ben Gurion International Airport briefly halted all departures and arrivals at 9am due to developments on the Syrian front. According to the Israeli regime’s army, the downed military jet came under “massive anti-aircraft fire” from the Syrian side. At no point since outbreak of the Syrian conflict has the situation deteriorated to such a level on the Syrian-Israeli boundary. Some have already started speculating on the chance of an all-out war between Israel and Iran, on Syrian territory. Last year, Prime Minister Benjamin Netanyahu tabled a bill that empowered him to declare war, if he sees Israeli national security at risk, without having to obtain the approval of his entire regime. 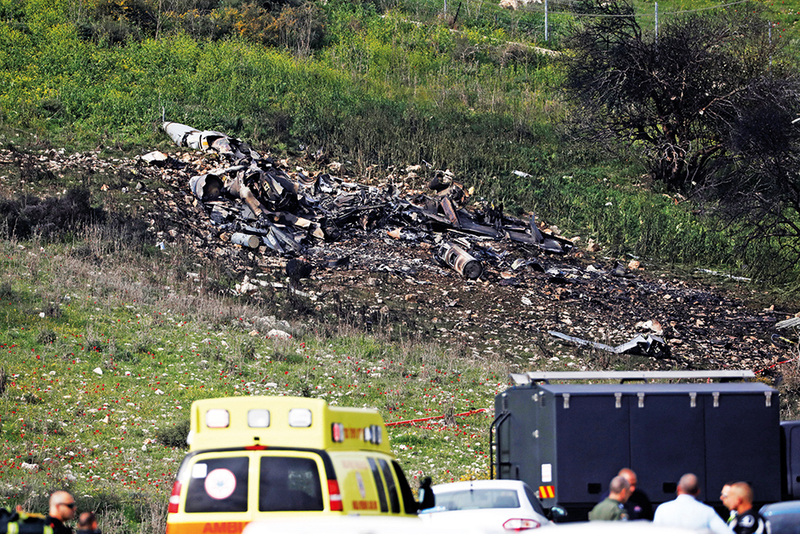 Photos of the Israeli F-16 went viral on social media networks, while Israel confirmed that the two pilots had ejected. One was severely wounded, while the other sustained minor injuries. The Israeli occupation army announced the Israeli operation was targeting Iranian military installations, claiming an Iranian drone had been intercepted in Israeli airspace, coming from Syria. Further Israeli attacks took place starting approximately 9:15am Damascus time and lasted until noon — a total of 12, striking at Al Kisweh, 13 kilometres south of Damascus, the T-4 Airport west of the ancient city of Palmyra, and the town of Al Dimas west of Damascus, which had been earlier targeted by the Israelis back in December 2014, accused of housing a Hezbollah military base. It remains unclear what exactly has been hit so far, although many point to Iranian military bases in the Syrian heartland, seeing them as possible targets. The Israeli regime’s Defence Minister Avigdor Lieberman has been meeting with his top brass while Netanyahu has been in open consultations with his military advisers. Amer Elias, a Damascus-based analyst and member of the ruling Baath Party, doesn’t think an all-out war will break out. Speaking to Gulf News, he said: “This is proof that Israel’s redlines are being shifted by new Syrian capabilities” saying that previous attacks had been at zero cost for Israel whereas now, “one of their top line US jets has been shot down”. Landis added: “Israel will undoubtedly seek to make Iran and Syria pay a heavy price in order to deter further action. This is sure to open a new chapter in the Syrian-Israeli conflict. US historian David Lesch, a ranking Syria expert, said a number of proxy players in the Syrian conflict are starting to take more direct action, “… and they are starting to bump into each other”. One reason, he claimed, was collapse of Daesh, which has “created a land grab between competing groups”. Second, is the lack of a political agreement to end the war, which prompts all sides to continue pursuing military interests. And, finally, is Israel’s concerns about growing Iranian influence in Syria, and by extension Lebanon as well. “To me," said Lesch, "this is the most concerning element right now in terms of what could touch off another wide-ranging war."